The Muhammad Ali First Aid Kit by Maria Papadonikolakis | Definitive Touch - Men's Contemporary Style. Graphic designer Maria Papadonikolakis of Brooklyn, NY, has designed this first-aid kit with the likeness of former World Heavyweight Champion Muhammad Ali. Maria hopes that putting Ali’s image on the kit will reassure children that champs get hurt too, and also give them an inspirational figure when they need one most. Very good idea. Well, do children know how Muhammad Ali looks? As long as that is a safe assumption, this is a very good idea. And the ‘Please dont try this at home’ kind of a message can be conveyed through this too. 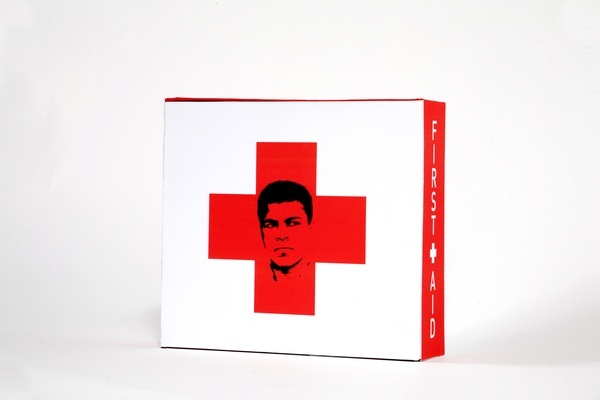 Where can one purchase the Muhammad Ali First Aid Kit?